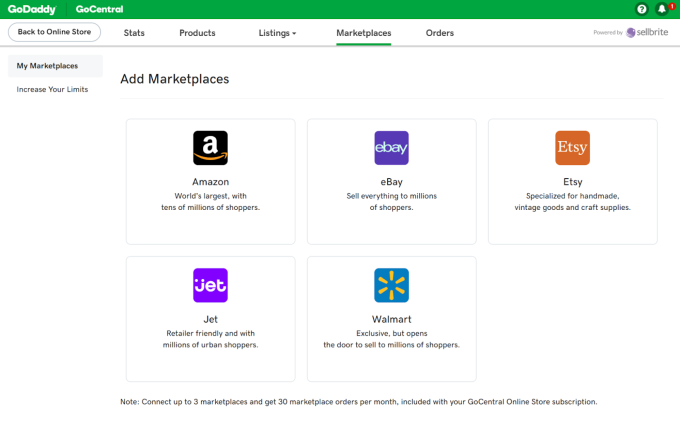 GoDaddy is making it easier for small businesses to list their products across Amazon, eBay, Etsy, Jet and Walmart.com today with the launch of GoDaddy Marketplaces. As part of the launch, GoDaddy is also announcing that it has acquired Sellbrite, the company whose technology is powering these new capabilities. Greg Goldfarb, GoDaddy’s vice president of products, e-commerce and customer engagement, said the companies were already working together to create and test out the marketplace feature. “As we proceeded through partnership, we got more and more convinced that it was a great fit, people-wise, experience-wise and product-wise,” Goldfarb told me. While GoDaddy may still be best known as a domain registrar and web hosting company, it’s been expanding in recent years with a number of small business tools, including its GoCentral website builder. Goldfarb said that anyone running a GoCentral online store will now be able to sell their products on other marketplaces with just a few clicks, and also connect their existing marketplace listings to GoCentral. “At this point, we’ve got the broadest capability in terms of how many marketplaces you can connect your online store too, and really the broadest and easiest-to-use capability across the website category,” he said. He contrasted this to other website-building products, which are “really focused on their own sites and don’t enable connectivity to marketplaces.” Meanwhile, other e-commerce platforms might promise similar capabilities, but they “don’t offer connectivity out of the box” like GoCentral does. Sellbrite co-founder and CEO Brian Nolan added that his team will be working to integrate Sellbrite more broadly “across the whole GoDaddy product,” while also serving existing customers with a standalone product. He also said that he and the entire Sellbrite team (of just less than 20 people) will be joining GoDaddy.